Arundhati Nag – someone whom I have associated with theatre in Bangalore, and theatre in Kannada, for a long time. And whom I have associated with other things worth emulating: grit, the never-say-die spirit, the persistence and the determination to achieve a stated goal, and more. So a meeting with her was something that I was looking forward to, even if I had to wait from 4 PM to 5.20 PM- I got my chance to talk to this icon of theatre. "Let’s go from the basics," I tell her as I sit opposite her at the lovely cafe at Ranga Shankara, the world class but affordable theatre facility in JP Nagar, Bangalore. "How did you get into theatre? "I had a happy, and ordinary, childhood," Arundhati replies. "I got into acting at school…we did ‘The Bishop’s Candlesticks’, I remember, and then I got involved with elocution and debates…..that’s how it all started." Arundhati’s school and college days were spent in indulging in her passion for the stage – Gujarathi, Marathi and Hindi, and winning best actress awards. She even got into Radio and TV. "At college," she reminisces, “I took up Physiology and Hygiene, mainly because I knew that Anatomy would be needed for the fine arts, so my focus was fairly clear, even then." How did the move to Bangalore happen? Shankar Nag and she became friends, and then more than friends, and they moved to Bangalore in 1979. “Shankar wanted to start a theatre group," she recalls. "We lived in a rented house in Rajajinagar, and I have a natural ear for languages, so I picked up Kannada very fast," she says. Sanket was the first Kannada play she acted in, and others followed, like Anju Mallige and Minchina Ota. “Sanket" did very well, much better than we anticipated," she says. "Bangalore is such a wonderful place! Prema and (BV) Karanth, the noted theatre persons of Karnataka, just embraced us, as did Benaka, their theatre group. They supported us in every possible way!" How was the move into Kannada theatre for them? "Anant (Nag) was already a star, and Shankar was an emerging talent. We were not here to ‘be better’ than anyone, it was a matter of winning hearts over. And Shankar knew that I would not last in Bangalore without theatre!" she laughs. The couple continued to stage plays, and she muses on the rehearsals of Nagamandala, where they would start rehearsals at 10 PM and go on until 1 AM, when the girls in the cast and crew had to be dropped back home individually! The need to build a theatre space was already in Shankar’s mind, Arundhati says, but the fruition of the idea somehow kept getting postponed; Arundhati says she talked to the people at Suchitra Film Society, but was hampered by the lack of green rooms and toilets there, as at Chitra Kala Parishath, too. The government was at that point giving sites to theatre award winners, but Shankar didn’t immediately take his site. "That was not his priority," she smiles. The couple moved to a farmhouse on Hosur Road, which was "back of beyond!" in those days, and which has been home for the past 22 years. Arundhati Nag with Girish Karnad. Pic: Deepa Mohan. "It took me a year to physically get over the pain and broken bones from the accident," she says gently. "I had so many unfinished pieces of work to complete; you know how it is when sudden death intervenes in your life…" She got the site for the theatre space from the government. What she describes about the J P Nagar site is very impressive. "The government really had vision," she muses; "The Comprehensive Development Plan had allocated a site each for theatre, a Post Office, a Police Station, and a park". She also tried her hand at running a club, the Country Club, at their farmhouse on Hosur Road. "Parameshwarappa, my friend, kept telling me, ‘Country Club ella beda!’ ", she smiles. So a group of them – Girish Karnad, Surendranath, Vijay Padki and she – got together, formed the Sanket Trust, and applied for the site. She remains the managing trustee and the creative director for the non-profit trust. They got one site four years after applying for it, and spent another two years to get it exchanged to the present one. "It’s a beautiful baby that has everything right," she says, and her kohl-lined eyes crinkle up with her happy smile. Then followed some years of fund-raising, from 1995 to 2004. Not a single paisa was paid as a bribe, Arundhati says proudly. "Call it the goodwill of Shankar Nag, or what you wish, but it worked." She says that the then Chief Minister, S M Krishna, helped her a lot. The Ranga Shankara annual theatre festival is a landmark on the Bangalore theatre scene now, with plays in all languages being staged, along with readings and platform performances. Ranga Shankara has staged more than 1200 performances to date. So, Ranga Shankara was born; but how is the 4-year-old doing now? Aru, as she is fondly known among friends, does not think of Ranga Shankara in purely economic terms. "The real cost of renting Ranga Shankara for an evening would actually be around Rs. 8000 to Rs.10,000,….I charge Rs.2,500" she shrugs. The charges, she says, are both nominal and notional. "I find so many young theatre groups facing affordability challenges, and I want to make the statement, each time, that if theatre space is made affordable, these groups can thrive," she exclaims. How is Ranga Shankara sustained then? “Vodafone supports us right now," states Aru. "But tomorrow, if the sponsor moves out, I may have to devise a more viable, sustainable alternative. But the mission of Ranga Shankara is ‘affordable theatre’…so as of now, I don’t bother too much about it." 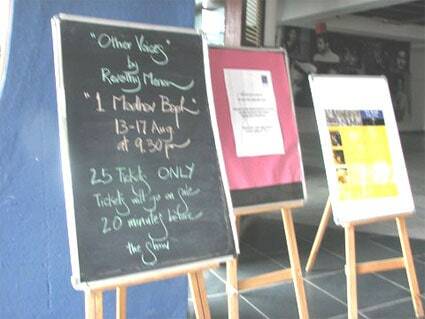 Rs.2500 would just about pay for the evening’s electricity bill, when one remembers the theatre is air-conditioned! When a theatre production is more expensive to bring to Bangalore, we charge a little more, she says; Shakespeare’s Measure for Measure cost us Rs.1 crore, and we sold tickets at Rs.200…just imagine, 300 tickets at Rs.200 each is Rs. 60,000!" she laughs. Apart from encouraging young and local theatre groups, she wants to bring directors like Neelam Mansingh or Renee Philippi from New York, to Bangalore, so that theatre-goers can see the work of people from other parts of the country, or the world. How difficult is it to sustain the ‘one play every day’ initiative that Ranga Shankara adopted? "Lots of challenges," she smiles again. "I come from a commercial theatre background myself, and know how difficult doing alternative theatre can be. I was doing 42 shows a month in 1973, before commercial theatre became fashionable," she adds. She has no quarrel with those who are into commercial theatre. "People like Lillette (Dubey) have found their mantra, of large, lavish productions, and multiple shows," she avers. "If that’s the sustainable way for them, it’s good that they do it, but that’s not the way I want to go now." Ranga Shankara’s AHA Program initiative. Pic: Deepa Mohan. And what *are* the ways she wants to go with Ranga Shankara? Two major initiatives have emerged – the first being ‘AHA!’started last year, which she talks of fondly as being for children, and refers to as "my pet". Arundhati decided that to have an initiated audience decades from now, they must be "caught young". For two months at the beginning of the school academic year (before academic pressures build up and take the children away), with the help of the Deccan Herald Newspapers in Education project, children from various schools are brought over at 11 AM to Ranga Shankara, where they are exposed to stage craft; at the end of the 8 weeks, they put up a play. "The parents and the teachers are the ones to be educated!" exclaims Aru. "The children will go where they are led, so it is up to the parents and teachers to inculcate a love of the theatre in them." The subjects the workshop tackles concern the live of children, and so far, she says, 30,000 children have seen Gumma Banda Gumma, one of the most popular plays. Aru also wants slum children to watch theatre and get involved. Britannia supports this project, and Ranga Shankara is actually able to pay the actors a little token sum of money, too! The other project that she has started last year is ‘Other Voices’, which aims at an intimate theatre experience, for short theatre pieces that might otherwise never be staged. "We have these small spaces at Ranga Shankara, that I wanted to use," she says. She started looking for small plays, and when Chetan Datar, the playwright, told her he had one, she decided that she would go ahead. "The first year, Revathi, the south Indian film actress, came as a guest star; then she came on her own, and now she performs in 1, Madhav Baug. Another play, The Stronger, was also a delicate, intimate piece. This is a form of theatre different from the supper theatre, held in a five-star ambience, now gaining ground in other theatre circles. How then, does Aru feel about not acting any more, but taking care of the administration of Ranga Shankara? "I don’t miss acting too much," she replies. Yes, there are the times when one would "give a left leg or a right arm" to play the part in Odukkalu Bimba or Bikhre Bimb. But I am content with Ranga Shankara, she says. And then, with the familiar twinkle in her eyes, she adds, "I would like to do something new, too! Neelam Mansingh is going to direct an Ibsen play for the centenary of that great playwright…I have told her, I would like to act under you!" After months of delay Namma Metro is finally being launched today. All five stations will be inaugurated this morning and the metro will be open for public from 4pm.